This section describes how to configure Oracle Entitlements Server to work with API Gateway. The following steps describe how to create a resource and an authorization policy for that resource in Oracle Entitlements Server. For more detailed instructions about each of these steps, refer to the OES documentation. Open the Authorization Management tab. Enter a name and a description for the new application, for example, MyApplication and First App. Click Save at the top right-hand corner of the page. Open the System Configuration tab. Double-click the Security Modules node in the tree. Click New at the top of the Security Modules table. Enter MySM as the name of the new security module. Click Add at the top of the Bound to Applications table. Leave the Search field blank and click the search button to the right of the field. 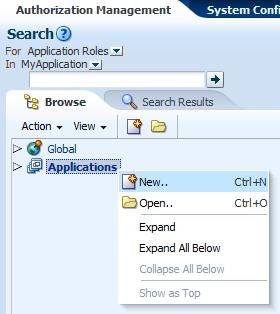 Select MyApplication from the search results and click Add. Open the Authorization Management tab again. Expand the Applications node and then expand the newly created MyApplication node. Double-click the Resource Types node. Click New above the table showing the existing Resource Types. Enter MyResourceType in the Name field. Add an action for this resource by clicking New above the Actions table. Add POST as an action. Expand the Default Policy Domain and then the Resource Catalog nodes. Click New above the table listing all existing Resources. 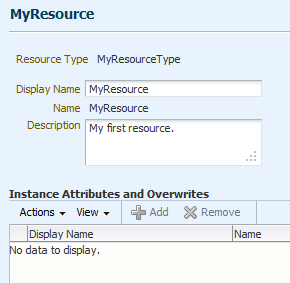 Select MyResourceType as the Resource Type. Enter MyResource as the Resource name. Double-click the Authorization Policies node beneath the Default Policy Domain node in the tree. Click New above the table showing the existing Authorization Policies. Enter MyPolicy as the name of the new policy. Chose to "Permit" access to the resource target using the corresponding Effect check box. Configure Principals (users, roles, or both) that can access the resource by clicking the "plus" button to the right of the Principals table. 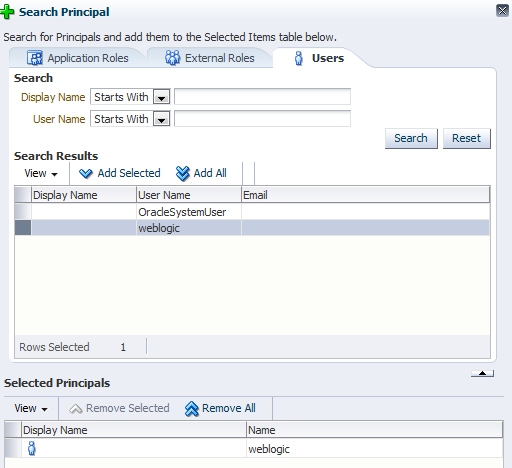 Select the default weblogic user from the table and click Add Selected to add the weblogic user to the Selected Principals table, as shown in the previous screenshot. Note The Configure Oracle Entitlements Server required a weblogic user to be available in OES. Click Add Principals at the bottom of the window. Next, you must specify a resource target that this policy will act on. Click the "plus" button to the right of the Targets table. Click the Resources tab on the Search Targets window. 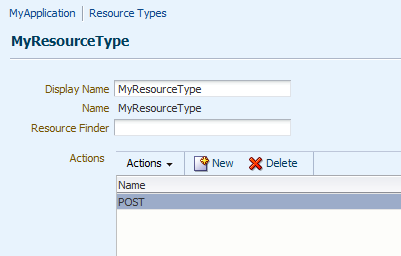 Select MyResourceType in the Resource Type drop-down and click Search. Select MyResource from the table and click Add Selected to add the resource to the Selected Targets table. Click Add Targets at the bottom of the page. The OES client distributes policies to individual security modules that protect applications and services. Policy data is distributed in a controlled manner or in a non-controlled manner. The distribution mode is defined in the jps-config.xml configuration file for each security module. The specified distribution mode applies to all application policy objects bound to that security module. Consult with the OES administrator to find out the distribution mode. For the purposes of this section, the controlled distribution mode is used. Open a command prompt and change directory to your OES client installation directory (this is referred to as OES_CLIENT_HOME throughout the remainder of this section). Enter the SSL port number of the Oracle Entitlements Server Administration Server. You can find the SSL port number from the WebLogic Administration console. By default, 7002 is used. On UNIX-based systems, run the config.sh script located in the OES_CLIENT_HOME/oessm/bin directory. Ensure that the security module has been configured correctly by checking that the OES_CLIENT_HOME/oes_sm_instances/MySM directory has been created. Alternatively, you can use the non-controlled or controlled pull distribution mode. Consult the Oracle documentation for configuring these modes. When the OES client has registered with OES, you can distribute the policy for that application so that clients making authorization requests for this resource will be subject to the policy enforcement rules. Double-click the MyApplication node in the tree on the Authorization Management tab. 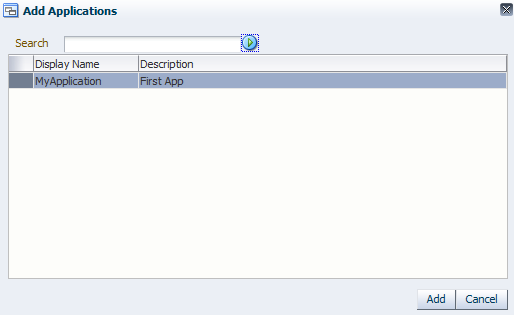 Open the Policy Distribution tab for the application configuration. Expand the MySM entry in the table. Select the MySM application and click Distribute to push the authorization policy configured for this application. You might need to click Refresh to update the Synced status. You should see a green tick to indicate a successful distribution. 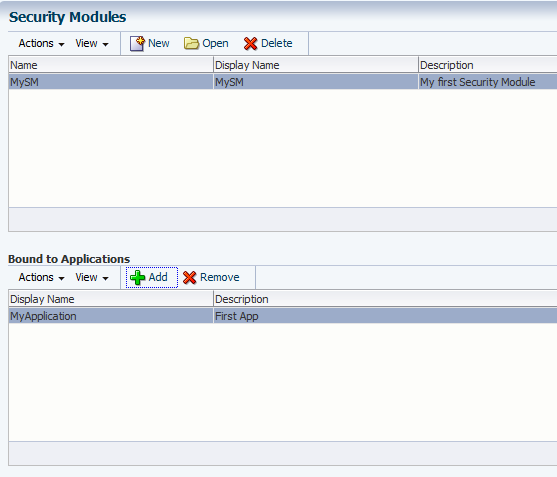 Note You might have to restart WebLogic for your newly registered security module to be displayed in the list on the Policy Distribution tab.